AP Police SI Final Exam Answer Key 2019: Andhra Pradesh State Level Police Recruitment Board (APSLPRB) has successfully conducted the Sub-inspector Mains Final written test on 23rd and 24th February For paper 1, 2, 3 and paper 4 in morning and afternoon sessions. Many of the hopefuls desirous to get the police jobs in the state of Andhra Pradesh have competed for the written test round. The examination has been conducted in a large number of examination centers across the AP State. AP Police department has taken proper care to organize the SI written test. Competitors who had applied for the Police SI posts have competed for the test with a great ambition to clear the written test round. All the hopefuls who are waiting to download AP Police SI Mains Answer key 2019 can wait for few days; stay checking the APSLPRB official website, slprb.ap.gov.in to download the answer key. The answer sheet will be soon available to download. All the competitors can download the answer key and compare with the answers given in it to estimate their probable score. The answer sheet will be released for all sets A, B, C, D. Candidates can compare with the corresponding set to estimate the score. Andhra Pradesh State Level Police Recruitment Board is specially formed to recruit the eligible people for state-level police jobs. The organization annually announces various recruitment notifications to hire suitable candidates into various positions. This year the APSLPRB announced 334 SI posts. The department has accepted applications for the announced posts in the month of November. A large number of applicants have shown interest in AP Police SI jobs and sent their applications to the announced posts. APSLPRB will shortlist the suitable candidates based on their merit in written test (preliminary, mains exams), physical standards test, and physical eligibility test and interview rounds. The competitors have to qualify all these rounds with good merit to get selected for AP SI posts 2018-19. The competitors who have competed for the AP Police SI written test can soon expect the answer keys of the conducted exam. The answer sheet is expected to release within 3 to 4 days after the examination (approximately). Candidates competed for the examination can keep checking the official website, slprb.ap.gov.in. The answer sheet will be released for all sets A, B, C, D. Compare with the answer key of the corresponding set to estimate the score. By comparing and evaluating the score, candidates can estimate their position in the level of competition, possibility to qualify the examination, and various other details. Hence the competitors can stay patient until the answer key is released by the APSLPRB. Manabadi, eenadu, sakshi, some coaching institutions will be release unofficial answer keys after completion exam. so students can download from below mentioned links. The Final Written Test was held on 23-02-2019 & 24-02-2019 in 4 locations viz., Visakhapatnam, Kakinada, Guntur and Kurnool from 10.00 AM to 01.00 PM and 2.30 PM to 5.30 PM respectively. Please find attached Final Answer Key for Andhra Pradesh State Level Police Recruitment Board – 2018-19 examination for SI (Civil), RSIs (AR/APSP), SFO & Deputy Jailor final Written Test conducted on 23rd and 24th February 2019 (FN &AN). The objections if any, on the key shall be sent on or before 28-02-2019 by 05.00 PM and they may be addressed in the following format to email id apslprb.obj@gmail.com. How to Download AP Police SI, RSI, Deputy Jailor Question Paper, Answer key Solutions 2019 Online? Initially visit the APSLPRB Official website, slprb.ap.gov.in. Log in with the user id, password. Search for APSLPRB Police SI Answer Key 2019 link on the homepage. The answer key will be downloaded. Compare with the answer sheet and estimate the score. 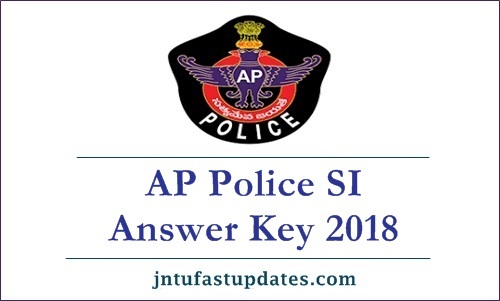 1.2 How to Download AP Police SI, RSI, Deputy Jailor Question Paper, Answer key Solutions 2019 Online? Macaroni wheat is grown in ?? What is the answer for this sir.. Send me answer key sir…..